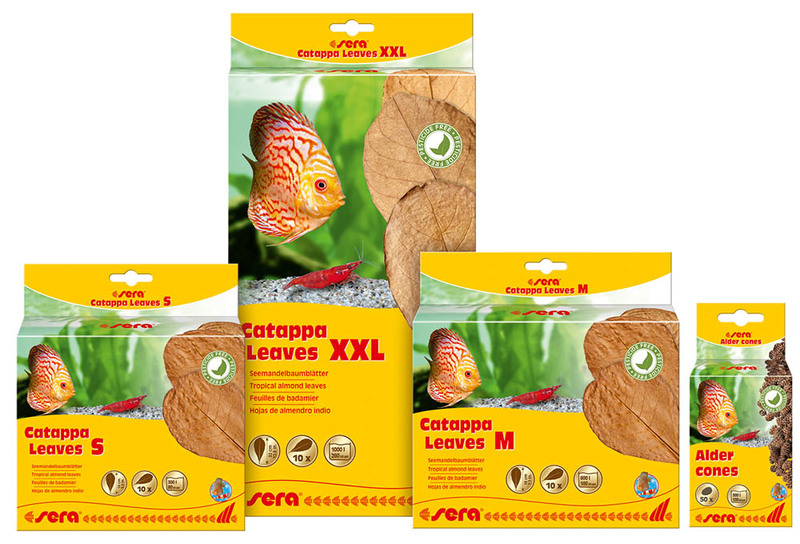 Heinsberg, Germany – sera is adding new products to their water care range: sera Catappa leaves in sizes ranging from small (S) to extra-extra large (XXL), and sera Alder cones. The sustainable natural products are guaranteed to be free from pesticides and thus allow for natural aquarium water care. Catappa leaves, also known as tropical almond leaves, come from Indian almond trees. They naturally contain humic and tannic substances, which have a positive influence on the water. Furthermore, they support the natural behavior as well as the readiness to spawn of ornamental fish and shrimps. By doing so, Catappa leaves contribute in many ways to the well-being of the aquarium inhabitants. Additionally, they can prevent infections by bacteria and fungi. The substances released by these leaves have astringent properties, which means wounds heal more quickly and the healing process is accelerated. Sera Alder cones also have useful properties: they as well contain humic and tannic substances that prevent fungal infections and spawn fungus. Furthermore, they lower the pH value. The water parameters should, therefore, be monitored. Alder cones additionally tint the water in a natural way, creating a blackwater environment. This ideally imitates the natural living conditions of many ornamental fish and invertebrate species, which is beneficial and useful for their successful care. For more information, visit www.sera-usa.com.